Tosafist and liturgical poet; flourished at Prague in the twelfth century; the brother of the traveler Pethahiah of Regensburg. He was among the earliest of the tosafists ("ba'ale tosafot yeshanim"), a contemporary of R. Eleazar of Metz, and a pupil of R. Tam ("Sefer ha-Yashar," § 704; Solomon Luria, Responsa, No. 29). According to Recanati (Responsa, No. 168), Isaac directed the yeshibah of Ratisbon. He also lived at Worms for a time ("Agur," 71b). 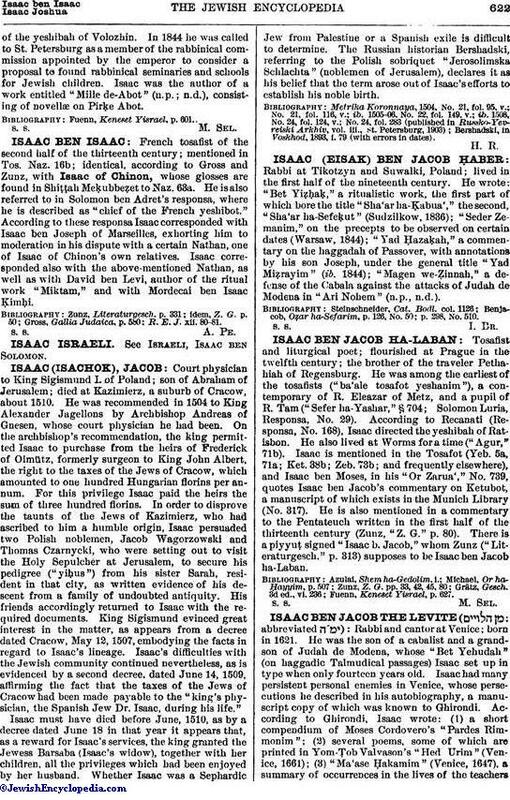 Isaac is mentioned in the Tosafot (Yeb. 5a, 71a; Ket. 38b; Zeb. 73b; and frequently elsewhere), and Isaac ben Moses, in his "Or Zarua'," No. 739, quotes Isaac ben Jacob's commentary on Ketubot, a manuscript of which exists in the Munich Library (No. 317). He is also mentioned in a commentary to the Pentateuch written in the first half of the thirteenth century (Zunz, "Z. G." p. 80). There is a piyyuṭ signed "Isaac b. Jacob," whom Zunz ("Litcraturgesch." p. 313) supposes to be lsaac ben Jacob ha-Laban. Fuenn, Keneset Yisrael, p. 627.